Life expectancy has been steadily increasing due to improved medical care and healthier life styles. An estimated 620 million people, representing 8.5% of the world population is 65+ year of age. By 2050, that number is expected to rise to 1.6 billion (17%). According to the World Health Organization (2015), 32% of that group (198 million) is fully edentulous (without teeth). Complete edentulism has been traditionally treated with complete dentures. If you have dentures, you’ve probably experienced their inherent problems; including the lack of stability, poor fit, inability to chew food properly and many others. More recently, predictable dental implant-based alternatives have become available. Imagine walking into the dentist’s office with no teeth and walking out with a beautiful smile, all in a matter of a few hours. A quick consultation appointment can determine if all-on-four implants (teeth in a day) is right for you. WHAT EXACTLY ARE ALL-ON-4 DENTAL IMPLANTS? All-on-4 dental implants (also known as teeth in a day), is a treatment concept for immediate temporary restorations in edentulous patients. The procedure itself consists of 4 (or sometimes more) implants that are strategically placed in an edentulous jaw, which are then used to support a fixed dental restoration (see image below). After the implants are surgically placed using a template to guide their placement, a temporary full-arch restoration is connected to the implants. The result is an amazing smile that is completed in a relatively short period of time. After that appointment is completed, you will return for a follow-up appointment in a few days. Implants usually requires an average of 3-4 months to integrate with the surrounding bone. During that period, you can continue your daily activities as usual. Once the implants are integrated, the definitive restoration can be made. This is usually completed in 4-5 appointments. You can select the shape and shade of the teeth you like for the final restoration and make any modifications based on your temporary restoration. Dental records including impressions and a special type of x-rays called cone-beam computerized tomography (CBCT) is needed to determine if you are a candidate for the procedure. Also, additional bone grafting may be needed to replace bone that may have been lost overtime. A history of uncontrolled medical conditions may be a contraindication for the procedure. This procedure is completed in the dental chair under local anesthesia similar to any other dental procedure. You also have the option of sedation. Some discomfort and/or swelling may occur. Also, a soft diet is recommended for the first two weeks. This will help minimize undue pressure on the implants while they integrate and protect the temporary teeth. WHAT MATERIAL IS MY TEETH MADE FROM? Titanium-reinforced resin: A titanium framework supports resin teeth and gums. This provides a natural look and has the added advantage for easy replacement of teeth when needed. Zirconia: A prosthesis that is machine-milled from a single, solid block of material. Its use has been widely adopted in dentistry due to its strength and aesthetics. 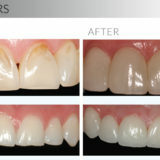 Porcelain-fused-metal: The restoration consists of separate bridges that are connected to the implants by cement or screws. Considered to be the gold standard in dentistry as it combines both strength and aesthetics. HOW LONG DO ALL-ON-4 IMPLANTS LAST? Once implants are placed and successfully integrate, they’re expected to remain indefinitely. Like with any other restoration, prostheses exhibit wear with time and may need to be replaced. 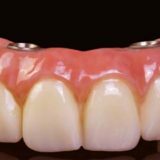 DOES THIS WORK ONLY FOR PATIENTS WITHOUT TEETH? The all-on-4 protocol can also be used for patients with remaining teeth that are planned for extraction. In that case, teeth can be removed, implants immediately placed and the temporary restoration attached during the same appointment. WHAT CAN I DO TO PROTECT & MAINTAIN MY NEW TEETH? Wear your night guard: if you clench or grind your teeth (especially during sleep), it’s a good idea to protect your restorations with a custom-made night guard. Continue to brush and floss: after every meal. There are adjunctive cleaning aids that can facilitate hygiene. We’ll review this with you in detail after the definitive restorations are delivered. WHO SHOULD DO MY TREATMENT? All-on-4 procedures are complex. Working with specialists who have advanced training and extensive experience in implant procedures is recommended to ensure a predictable outcome and longevity for your restorations. A team consisting of a prosthodontist and a surgeon usually work together to plan and carry out the treatment from start to finish. Call us today to schedule your consultation and find out how all-on-4 dental implants can give you the smile you’ve always wanted. previousPorcelain Veneers: Are They Right For Me?